I'm always looking for fun music for my children..... a few years ago while looking through the catalog, Music in Motion, I saw a CD done by a college music ed. classmate of mine! He was the kind of person that you just knew would go places with his music. He started out as a music educator in the Dallas, TX schools and now holds a church job and writes/records his own music for children. I quickly sent out an email to my college friend (he is going by the name "Mister Mark") to congratulate him and he sent me his first CD, You've Got a Song, in the mail. I began using some of the music in my cherub choir at church and the kids LOVED it! My own kids listened to it in the car and after a while we were all singing the songs. A couple of years after that we got the information for a local chorister's guild event, and the guest clinician/conductor for the day was my friend, Mister Mark! I am so proud of him, and his music is infectious and fun. You can listen to his songs on his website. Today we were listening to the song "Go Galileo" -- My five year old can tell you that Galileo was the master of philosophy and made changes to the telescope. There is another song about the three states of matter that is still stuck in my mind as well. His second CD is all science oriented, and the first CD is a hodge podge. My favorite song he has done is "Amazon Rock" and you can listen to the full song on his website. 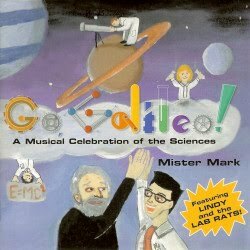 If you want fun music that gets your kids singing and dancing, this is it - and as a bonus they will remember some important science facts as well!